JCCC adds new initiatives that advance overall sustainability goals. Thanks to a new recycling program that diverts salon waste from landfills and waterways, Johnson County Community College School of Cosmetology has become Green Circle Salon Certified. JCCC is the first community college in the nation to be a part of the program, and is the second school in the Midwest. In collaboration with the JCCC Center for Sustainability, the School of Cosmetology will reduce their landfill-bound waste. Hair and cotton will be collected for composting; salon chemicals, disposable gloves and other salon-specific items will be recycled through the program, which focuses on providing sustainable solutions for managing salon and spa waste. Krystal Anton, the Center for Sustainability's Recycling and Waste Minimization Coordinator was informed of the program by a friend of hers who is a graduate of the JCCC Cosmetology program and a stylist in Denver. “My goal for 2017 was to do more outreach to our satellite locations and increase the post-consumer composting, so it seemed like a good time to propose the idea because it covers both areas. Anton and Sustainability Project Manager Michael Rea, presented the idea to the cosmetology program in January. Lana Hodes and Kris Dye of cosmetology had heard of the program previously, so they were very receptive to it. Anton and Dye took photos of the specific items that are used at the school and used those photos to make the presentation and signage specific to where those items needed to be sorted, Anton explained. Then Green Circle sent material sorting bins and shipping boxes along with a chemical collection system. Everything is weighed and recorded to keep track of the diversion rate specifically from the cosmetology program. Green Circle has also agreed to take the disposable gloves from JCCC's nursing program;. With a $10,000 grant from PepsiCo Recycling Zero Impact Fund, JCCC's Center for Sustainability is building the infrastructure to support post-consumer compost, according to Krystal Anton, the center's recycling and waste minimization coordinator. "We collect kitchen food waste for our composting program now, but there is an additional 51 tons of material that could be diverted from the landfill by collecting it as post-consumer compost," Anton said. "This includes restroom paper towel waste, food and food packaging waste from the dining services and catering, and making composting available to interested offices." During the most recent waste audit, it was found that restroom paper towels make up 14 percent of the total weight of what is thrown away in campus buildings. 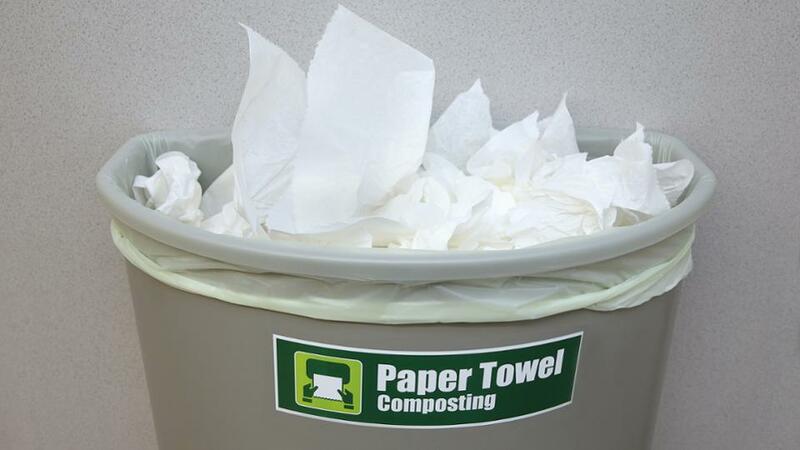 Thanks to the grant, GEB and OCB restrooms have become pilot areas for collecting paper towel waste as part of the post-consumer composting roll-out. Each restroom now has a container for trash and a separate, labeled container for paper hand towels, which will be routed for composting. Currently, campus kitchen food waste is being composted on campus for use at the Open Petal Farm, and paper towel waste will be sent to Missouri Organics which also takes the campus wood waste. JCCC is striving to be carbon neutral; these efforts help advance the campus towards that goal.